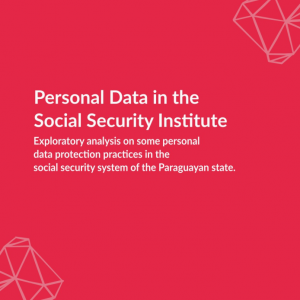 The Social Security Institute (IPS, for its acronym in Spanish) of Paraguay is the most important public social insurance system in the country. In the absence of regulations, competent authority, supervision and systematic sanctions for the protection of personal data, along with almost nonexistent litigation in this area, this results in concerns around privacy, confidentiality in health data. The evidence gathered in this investigation indicates that the storage of sensitive data – biometric – of the insured persons does not have a regulation for the protection of public databases. The research shows significant evidence about who and for what purpose the medical examinations of the workers are taken. It is possible that the access to the medical history of the workers is in the hands of the administrative personnel of the companies; and that in some cases they are not delivered by default to the workers, but only when they request it. At the same time it is possible to access sensitive health data beyond what is allowed by current labor regulations, and that, as a consequence, this leads to discriminatory measures in the workplace.